Gondolas, ferries, buses, trains - none of these transit modes make sense as long as 98% (or even 90%) of the people choose to drive personal vehicles. "All of this is part of a federal grant application, so we will have to wait and see how it goes." We do not have unlimited funds to evaluate these pipedreams and just because the federal govt is handing out our tax dollars does not make them free - taxes are our money. Even corporate taxes are our money because corporations include their expenses (taxes are an expense) in the pricing of their products. The same is true of "mobility fees" - developers simply add the fee tho the cost of the house, so it is actually another consumer tax. The federal govt operates in the red (deficit spending), so not only are taxpayers (us) responsible for the cost of boondoggles, we are also responsible for the interest accrued on the borrowed money funding the studies and building of those boondoggles. "The possibility of aerial tramway development around commercial areas in Pinellas County and providing transportation to and from the beaches is intriguing to say the least." Can you at least tell us how intriguing the possibility is? How much will it cost taxpayers to build and operate such a system? How much will riders contribute to the capital (0?) and operating costs (20%?)? What will be the net benefit to taxpayers? Less traffic? Less pollution? There is not an overwhelming traffic problem in St. Petersburg - one can drive through downtown at 5:00 on a weekday and find little or no congestion. Can you demonstrate that a gondola system anywhere in the world actually pays for itself and actually reduces congestion and/or pollution? Tourism commission studies show that almost all tourists arrive in Pinellas county by car - their own or a rented car. Or sometimes they arrive at the airport and local family or friends provide transportation in their car(s). How many tourists arrive at the beaches without a car and use the "trolley" to travel back and forth to downtown? Does the volume justify the cost of providing the capital equipment and operating costs? a bus, train, gondola or ferry in Pinellas County or St. Petersburg, even though they are paying 97% of the cost of those conveyances? Has anyone considered how many taxi/Uber/Lyft rides could be subsidized for low income people who truly need transportation assistance? The infrastructure (roads) is in place. 98% of the people choose to drive. It would seem that 98% of transportation investments should be to maintain our roads. What can we do to maximize the return on investment of our tax dollars? 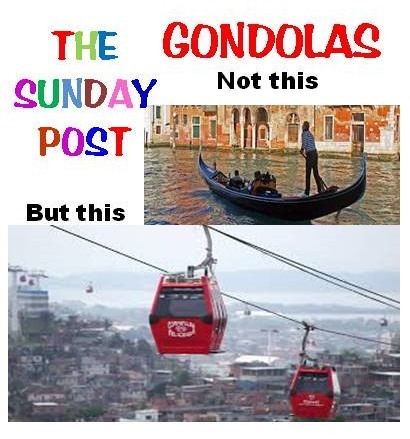 Build gondolas? Surely not. For those who abhor driving and/or cars in general, there are plenty of empty condos and apartments for sale or rent in downtown St. Petersburg. Residents can walk to work and shopping and take a taxi or Uber/Lyft service to the beaches when they need to travel outside their walking limit. Since they would not incur the cost of owning and operating a vehicle, this should be a simple economic and environmentally conscious decision.